Understanding how to create an organized information architecture for complex processes is essential to creating a successful user experience. Here are a couple examples of user journeys that I have created for past clients. Project Outcome is an online tool to help librarians measure impacts through patron surveys. The report builder was designed as an internal tool to allow the creation of filtered survey data reports. 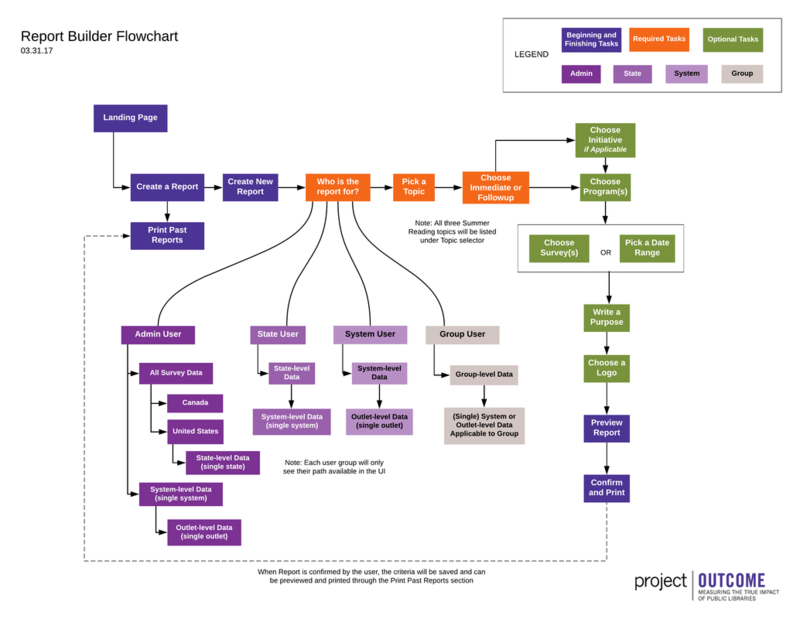 This flowchart was created to map out the tool's functionality by user type. Using the client's procurement knowledge and her collection of notes and web links in a OneNote document, the process of defense contracting was mapped out over a series of diagrams to help three different user types navigate defense contracting: those new to the process, those with experience as a subcontractor, and those with experience as a prime contractor. The diagram is also interactive and links users to different pages within the contractor portal. Visit the site.